President Obama’s speech today announcing his new executive action on guns was very different than the kind of speeches he’d been giving time and time again after mass shootings. He spent time recounting the mass shooting during his term, saying, “Fort Hood, Binghamton, Aurora, Oak Creek, Newtown, the Navy Yard, Santa Barbara, Charleston, San Bernardino. Too many.” But he turned from that sadness and frustration, which was also present during the speeches after mass shootings, and he spent time going point-by-point on the specifics of his executive action. It is a evolution in the way Obama has talked about guns. During his first year as president, a gunman shot and killed 13 people at Fort Hood in Texas. 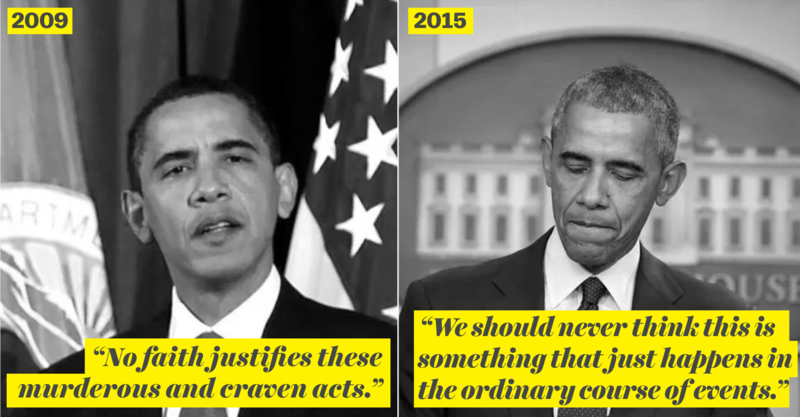 Obama’s remarks afterward were largely to the families — and largely about the American way and justice. “We are a nation of laws whose commitment to justice is so enduring that we would treat a gunman and give him due process, just as surely as we will see that he pays for his crimes,” Obama said after the first Fort Hood shooting. There was a second in 2014. There have been dozens of mass shootings since, including ones last month in in San Bernardino and at a Planned Parenthood in Colorado. And his remarks went from sympathy and sadness to anger and frustration. And he started pointing out how frequently these shootings happen. But today’s gun speech was decidedly different in tone, despite how much time he spent grieving again for gun victims.